A mobile hotspot network will enable riders on fast-moving trains to stream HD videos without interruption while underground, thanks in part to a newly-developed mmWave wireless backhaul technology. The first commercial service using this technology will debut later this year. Daejeon, Korea, Feb 8, 2018 - (ACN Newswire) - A mobile hot-spot network featuring an extremely fast 1.25 Gbps data transmission has been developed for public transportation systems by ETRI in South Korea. A pilot project featuring the new technology in Seoul's subway lines will begin later this year. The network is able to provide ultra-fast internet service in high-speed trains by combining two technologies. First, the network transmits data using millimeter waves with a frequency over 20 GHz, which enable data transmission 100 times faster than existing WiBro backhaul networks. Backhaul networks work as intermediaries, linking receivers on the trains with the public Internet, via radio towers along the tracks. The second key part is a fast hand-over technology that seamlessly transfers data transmission from one base station to another; no delay or disconnection like those experienced when a video freezes or a cell phone call is dropped when transitioning between service towers. 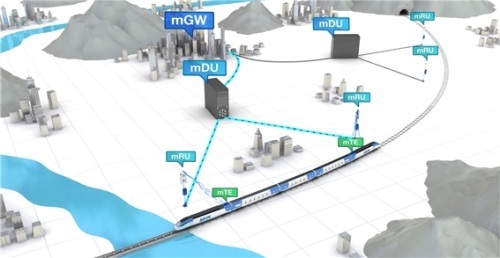 "The mobile hot-spot network (MHN) technology can provide high-speed Wi-Fi services even in a fast running subway train, just like home Wi-Fi," said Hyun Kyu Chung, the president of ETRI's 5G Giga Service Research Laboratory. "Our technology will provide the world's first commercial service using millimeter waves as a moving wireless backhaul for subways." ETRI successfully demonstrated data service up to 500Mbps in 2016, and then up to 1.25Gbps in 2017. The technology may enable a maximum of 550 users to watch a video simultaneously through Wi-Fi in a running subway train. As high speed data communication such as virtual reality and augmented reality are required in the foreseeable future, this technology is likely to become a major need in public spaces. It is also likely that such technology will be recommended as an international standard for 5G networks (the fifth generation of telecommunication networks). ETRI is currently collaborating with other institutes to develop an enhanced mobile hot-spot network (MHN-E) to provide service up to a whopping 10 Gbps. ETRI also plans to demonstrate various 5G services based on MHN-E on buses during the Olympic Winter Games PyeongChang 2018. Established in 1976, ETRI is a non-profit Korean government-funded research organization that has been at the forefront of technological excellence for about 41 years. In the 1980s, ETRI developed TDX (Time Division Exchange) and 4M DRAM. In the 1990s, ETRI commercialized CDMA (Code Division Multiple Access) for the first time in the world. In the 2000s, ETRI developed Terrestrial DMB, WiBro, and 4G LTE Advanced, which became the foundation of mobile communications. As a global ICT leader, ETRI has been advancing communication and convergence by developing SAN (Ship Area Network) technology, Genie Talk (world class portable automatic interpretation; Korean-English/Japanese/Chinese), and automated valet parking technology. As of 2017, ETRI has about 2,000 employees where about 1,800 of them are researchers. Please visit https://www.etri.re.kr/eng/main/main.etri.